In Christian eschatology, the Antichrist or Anti-Christ is a powerful, evil leader who will arise in the Last Days in opposition to God and His church. From its New Testament origins as a description of teachers who denied orthodox teachings concerning Jesus Christ, the term antichrist attached itself to other biblical characterizations about a leader who would arise in the Last Days to control the world and lead humankind away from God. Antichrist is translated from the combination of two ancient Greek words αντί + χριστος (antí + khristos), which means anti "opposite" (of) khristos "anointed," therefore, "opposite of Christ." The word anti can also be translated "as if," and thus antichrist can also mean someone who pretends to be a Messiah. Various individuals in history have been identified as the supposed Antichrist. 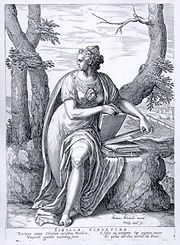 Many scholars believe that the author of the Book of Revelation referred specifically to the Emperor Nero, whom he identified by the number 666. Other candidates as Antichrist have included various popes or the papacy itself, Martin Luther or his son, several kings, and—in more modern times—Gregory Rasputin, Hitler, Stalin, Ronald Reagan, Gorbachev, and various Secretaries General of the United Nations. Thus, the term antichrist originally referred to a number of teachers to whom the author of 1 and 2 John objected on theological grounds. He could thus speak of "many antichrists," who rejected the idea "that Jesus is the Christ," who denied that Jesus is from God, and who also denied the proposition that Jesus came in the flesh. Both 1 John and 2 John appear to be particularly concerned with the doctrine known as docetism, which taught that because the flesh itself is evil, Jesus did not possess an actual physical body. In addition, the Gospel of Matthew warns of "false Christs," and of deceivers who would appear claiming falsely to be the returned Christ (Matt. 24:4-5). At some point—though not in the New Testament itself—the term antichrist was applied to a particular person, the "man of sin" or "son of perdition" mentioned in 2 Thessalonians 2:3. Here, Saint Paul predicts that a "man of sin" is to take over the Temple of Jerusalem, on the pretense that he is God himself. Christians also interpret Chapter's seven and eight of the Book of Daniel as a prophecy of the Antichrist. 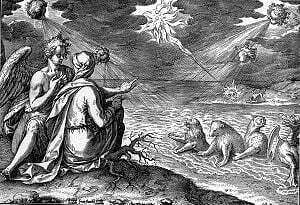 Daniel's vision of various beasts is interpreted by some Christians to refer to the time of the Antichrist. When rebels have become completely wicked, a stern-faced king, a master of intrigue, will arise. He will become very strong, but not by his own power. He will cause astounding devastation and will succeed in whatever he does. He will destroy the mighty men and the holy people. He will cause deceit to prosper, and he will consider himself superior. When they feel secure, he will destroy many and take his stand against the Prince of princes. Yet he will be destroyed, but not by human power (Daniel 8:23-25). 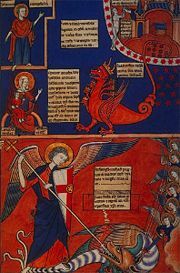 The most important New Testament work in terms of the popular conception of the Antichrist, however, is the Book of Revelation, which speaks of several figures who will appear before the Final Judgment to test Christians: The Dragon, the Beast, the false prophet, and the Whore of Babylon. Most popularly, the term is associated with the Beast, whose number is "666." However, the usual concept of "The Antichrist" normally combines the characteristics of several of these figures. Related ideas and references appear in various apocrypha, and a more complete portrait of the Antichrist has been built up gradually by Christian theologians and folk-religionists. At that time the Prince of Iniquity who will be called Antichrist will arise from the tribe of Dan. He will be the Son of Perdition, the head of pride, the master of error, the fullness of malice who will overturn the world and do wonders and great signs through dissimulation. He will delude many by magic art so that fire will seem to come down from heaven. … When the Roman empire shall have ceased, then the Antichrist will be openly revealed and will sit in the House of the Lord in Jerusalem. In other views, the role of a single person is far less dramatic. Instead, the Antichrist is believed to be a group of individuals as well as organizations, who, for their history of trying to deceive and stifle the faithful, are finally destroyed for all time by God on the day of Armageddon. Christians disagree on what will happen in the end times, and the role that antichrists or the Antichrist will play. Some believe that antichrists are those of whom John wrote—-teachers of false doctrines concerning Christ and his incarnation—-rather than a single individual. Some expect the false prophet and other characters mentioned in the Book of Revelation to arise separately from these antichrists, while others take the Book of Revelation more allegorically, or believe it to have referred to events in the past, during the period of Christian persecution in Rome. Revelation describes a situation sometime prior to the expected return of Jesus, in which there will be a period of "trials and tribulations" during which the Beast, inspired by Satan, will attempt to win supporters with great works, and will silence anyone who refuses to signal their allegiance by receiving "his mark" on their foreheads or right hands. This "mark"—-often thought to be synonymous with the Beasts "number" of 666-—is expected to be required to legally partake in commerce, as noted in Revelation 13:16,17. Some Christians believe that the Antichrist will be assassinated half way through the Tribulation, but will be revived and Satan will dwell in him. The Antichrist will continue on for three and a half years following this, until he is finally defeated by Christ. Then the "Dragon" (often interpreted as "Satan" or "the devil"), the "Beast" (often interpreted as the Antichrist) and the "false prophet" (interpreted in various ways)—-and all who received his "mark"—-will be thrown down and cast into a lake of fire. Satan will be released from his prison and will go out to deceive the nations in the four corners of the earth—Gog and Magog—to gather them for battle… But fire came down from heaven and devoured them. And the devil, who deceived them, was thrown into the lake of burning sulfur, where the beast and the false prophet had been thrown. They will be tormented day and night for ever and ever (Rev. 20: 7-10). The numbers 666 or 616 are associated with the Antichrist, according to Revelation 13:18. The Jewish practice of Gematria—in which letters are assigned numerical values—and other numerology techniques are used to calculate the numeric value of a name in attempts to confirm the identity of the Antichrist. The author of the Book of Revelation may have had the Emperor Nero in mind when he spoke of the "Beast" whose number is 666. Those who believe the Book of Revelation applied to the times it was written in, look to an early Antichrist. The Roman emperor beginning with Nero has been understood from very early times as the Beast of the Apocalypse. This is supported by some numerological interpretations, by which his name adds up to 666 using the Hebrew system of gematria. In this tumultuous period, superstitious fear and mob violence grew against Christians, and the Roman wars against the Jews intensified (66 C.E.–70 C.E. ), ending with the destruction of the Temple in 70 C.E. under the command of general Titus (later emperor), and the slaughter of the Jews who were living at Jerusalem. According to tradition, Nero ordered the crucifixion of St. Peter and the beheading of Saint Paul. Both Jewish and Christian literature survives, referring to Emperor Nero as the Antichrist. In the second and third century, the Antichrist was identified in various ways by the Church Fathers. To Irenaeus, it was the spirit of heresy; to Polycarp, it was the the Roman empire; and to John Chrysostom it was the resurrected Nero. Arnulf of Rheims wrote in 991 C.E., "What do you estimate this to be, reverend fathers? When you see him sitting on a lofty throne glittering in purple and gold, what do you estimate this to be, I say? Without a doubt, if he lacks love, and is only swelled up and lifted up, must he not be the Antichrist, 'sitting in the temple of God, and also showing himself as God'”? The Antichrist, by Lucas Cranach the Elder—1521, commissioned by Martin Luther. Cranach portrayed the Antichrist as the Pope, complete with the papal tiara. Another idea that began appearing early in the history of the Christian church is that the Antichrist will be an apostate priest or Christian secular ruler, perhaps a Pope or other high leader of the Christian church, or a pretender to the Papacy. 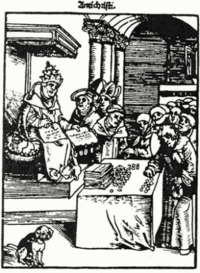 Various popes became candidates as movements criticizing the wealth and corruption of the Catholic Church in the early Middle Ages. Some of the Spiritual Franciscans considered the Emperor Frederick II a positive Antichrist who would clean the Church from riches and clergy. Some Protestant churches have made it an issue of faith to identify the Bishop of Rome and the papal system as the Antichrist. The Smalcald Articles, Westminster Confession, and the 1689 Baptist Confession of Faith are specific examples. The early Protestant Reformers, including Martin Luther, John Calvin, Thomas Cranmer, John Knox, Cotton Mather, and John Wesley, identified the Roman papacy as the Antichrist. Headed by Matthias Flacius, several Lutheran scholars in Magdeburg, known as the Centuriators of Magdeburg, wrote the 12-volume Magdeburg Centuries to discredit the papacy, including identifying the pope as the Antichrist. Many popes have been called the Antichrist by their enemies, and many popes have applied this title of "Antichrist," "son of perdition," or "man of sin," to their enemies as well. Some Catholics expected a son of Martin Luther to be the Antichrist, as his scion would be the son of an ex-priest and ex-nun. After the reforms of Patriarch Nikon to the Russian Orthodox Church of 1652, a large number of Old Believers held that Peter the Great was the Antichrist, because of his treatment of the Orthodox Church. In response to the identification of the papacy as Antichrist, a Catholic view was advanced beginning in the sixteenth century of a personal Antichrist to come just before the end of the world and to be accepted by the Jews and enthroned in the rebuilt Temple of Jerusalem. This interpretation, in modified form, is now accepted by most premillennial dispensationalists. 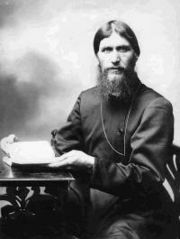 Gregory Rasputin was thought by some in the Russian Orthodox Church to be the Antichrist. In 1914, a woman believing the faith healer Rasputin was the Antichrist, stabbed him, cutting a large wound in his chest. He fully recovered, which increased the number of people who believed he was the "man of sin," since the Antichrist is supposed to receive a mortal wound and yet live. The Leader of the Free Presbyterian Church, Ian Paisley, loudly denounced the then Pope, Pope John Paul II, as the Antichrist while the pontiff was giving a speech at a sitting of the European Parliament in Strasbourg in 1988, when Paisley was a Member of the European Parliament. Ronald Reagan was thought by some to be the Antichrist after he, like John Paul II, recovered from a gunshot wound. The rose colored birthmark on Mikhail Gorbachev's on his forehead was seen by others that he, rather than Reagan, was truly the Beast or his agent. Both Josef Stalin and Adolf Hitler were also identified by some as the Antichrist. Popular Christian author Tim LaHaye put forward the idea that the Antichrist may be a current or future Secretary-General of the United Nations. LaHaye and Thomas Ice have also suggested that the rise of militant Islam in the twenty-first century is a possible sign of the End Times. Islam, in their view, is the false religion and of the Antichrist, otherwise known as the False Prophet. Muslims, on the other hand, also believe in the false Messiah, or Maseeh Dajjal, in Arabic also called Awar Dajjal and "The One Eyed Liar." Jerry Falwell told a pastors' conference in January 1999, in a sermon on the Second Coming, that the Antichrist was probably alive on earth, and certainly a Jewish male. He subsequently clarified that "this is simply historic and prophetic orthodox Christian doctrine" and had no anti-Semitic roots. Conspiracy theorists have claimed that the immortal Count of Saint Germain is the Antichrist or somehow analogous to Lucifer. The German philosopher Friedrich Nietzsche, called himself the Antichrist. Jose Luis de Jesus Miranda, a minister with a large Latin American following, claims not only to be God, but at the same time, the Antichrist. He also has 666 tattooed on multiple places on his body. In addition, certain occultists have proclaimed themselves to be the Antichrist, including John Whiteside Parsons. The Antichrist is also a popular archetype for villainous behavior. All links retrieved April 5, 2016. Encyclopaedia Britannica: Antichrist - full article. www.britannica.com.